The editors of View From the Overlook, thank Robert Gaebler, former Park School student and current Illinois resident, for submitting the following article. Anyone who possesses additional information about Park School is encouraged to contact the editors of this publication at www.heightshistory@aol.com or Mr. Gaebler at rgaebler@earthlink.net. Although I only attended Park School in Cleveland Heights for two and a half years, part of second grade and third and fourth grade, before it closed in 1942, the school left a deep impression on my life, and probably started me on a lifelong pattern of creative problem-solving, just as its founders might have wished. But the great mystery about Park School is that much of its history remains obscure. Finding traces of this school which had such a large impact on my life in the late 1930s was almost impossible. Histories of Cleveland and Cleveland Heights make almost no mention of Park School except as the institution from which Temple Anshe Emmeth bought the land upon which Park Synagogue now rests. It has bothered me greatly that a school which had so great an impact on the early formation of my character should have virtually vanished from the Earth without a trace. So my recent trip to Cleveland focused on cracking that mystery, and I did have some modest success. At first I found almost no reference to Park School in any sources. A search of the local newspaper, the Heights Press, at the Cleveland Heights Library, made no mention of Park in the year it closed, 1942. The Cleveland Heights Historical Society had no information on it and neither did the Western Reserve Historical Society. Finally, in the Special Collections section of the Case Western Reserve Library, Sue Hanson found a brief History of Park in a History of Cleveland, which I have quoted in full below. Park School flourished for nearly a quarter-century as one of the area’s pioneer progressive schools. 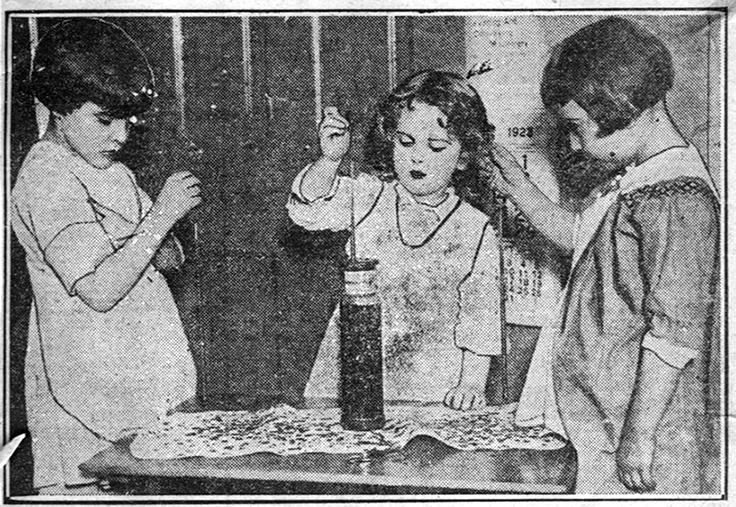 It was founded in 1918 by a group of area Vassar alumnae who wanted to provide a type of kindergarten unavailable in Cleveland. Early sponsors included Dr. and Mrs. Alexander McGaffin, Henry Tucker Bailey, Mrs. Wm. Feather, and Mrs. Charles Thwing. The first kindergarten was located in a room at the Day Nursery and Kindergarten Assn. on E. 98th St. and later moved into a house on Adelbert Rd. As higher grades were added, the school leased quarters from the Cleveland Tennis and Racquet Club in Cleveland Hts. “Where Park School Will be Found Next September. An airplane photo by Aerial Surveys Inc. showing the new site for Park School in the Rockefeller estate. The school will have 12 acres adjoining a private park. There will be entrance ways to the school property from both Mayfield Road and Euclid Heights Boulevard. The buildings that housed Park School are still intact, except for one building and an enclosed passageway which succumbed to fire several years ago. A half dozen years ago I peered into my old fourth grade classroom, where we studied dinosaurs and the planets back in 1941, and saw above the blackboards the same pictures of planets and dinosaurs that hung there 60 years before! On the most recent trip in 2003 I visited the old lunch room/gym/auditorium, and found several of the old orange mugs I used to drink milk out of 63 years ago! Words can't begin to describe the joy of drinking once again from a cup which has been thought to have been destroyed for almost two thirds of a century! Who says you can't go back? “Inclination Is Their Leader and Guide; Park School–Where Children Are Developing Along the Most Natural Lines; Dip, dip, dip. Into the hot, melted paraffin go the growing candles. Later other Park School children may use them to adorn the cutest placecards imaginable. Left to right the miniature dippers are Kathleen Webster, Kathleen Firestone, and Betty Baudauf. Another piece of the puzzle was clarified by Rabbi Armond Cohen of Park Synagogue. Rabbi Cohen is now in his 90s, and was instrumental in buying the Park School land for Congregation Anshe Emmeth back in 1942. He had had personal contact with John D. Rockefeller back in New York and knew some of the history of Park School before it became the home of Park Synagogue. It seems that Rockefeller had built rather nice homes in the area around what later became Park School, and some of the folks who settled there wanted a private school nearby for their kids. 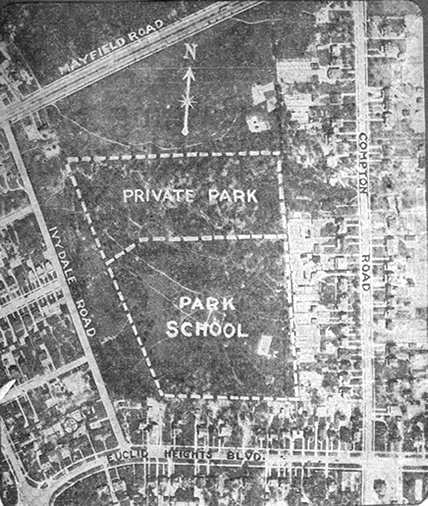 So Rockefeller made land available so that Park School could move to the land off Ivydale in Cleveland Heights, the same land now occupied by Park Synagogue. 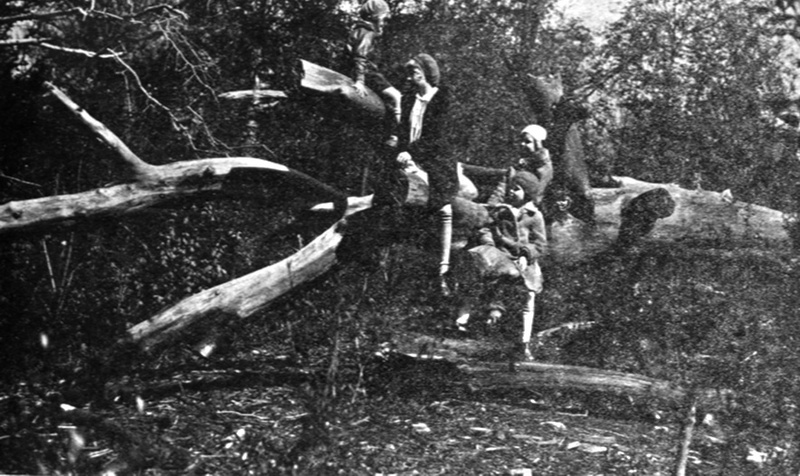 Rockefeller continued to be a supporter of the school, often making good its operating deficit at the end of the year. But in 1942 he had an audit done of the school finances and learned that many families were not paying any tuition, and he may have begun to feel that they were freeloading on his generosity. The withdrawal of Rockefeller's financial support was more the death knell for the school than any dislocation of teaching staff caused by the war. Rabbi Cohen reports that after the Congregation bought the school, Rabbi Cohen went to the principal's office and found the school records, which he believes may still be in the basement of Park Synagogue. Among those papers was an operation manual which stipulated, among many other things, that Park School should never enroll more than 10 percent Jewish students. Exclusionary clauses were quite common in those days, and a 10 percent quota may even have been generous for its day in the eyes of the non-Jewish community. Apart from that, the student body was fairly mixed, although class pictures to not show any black or Asian students. My own family was of very modest means and must have been one of the ones subsidized by Mr. Rockefeller. But one of my classmates, Charlie Baker, was the grandson of Newton D. Baker, who was mayor of Cleveland from 1912 to 1916 and Secretary of War in Woodrow Wilson's cabinet during World War I. Another student, Betty DiMaiorobus, was the niece of a powerful Cleveland politician. In a lower grade were the twin daughter and son of a prominent psychiatrist on the staff of Western Reserve University Hospitals. I suspect a complete student roster, if we are ever able to find one, would reflect a broad spectrum of middle-class Cleveland society of the time. All of this takes us far beyond what we knew when I planned my trip to Cleveland. The two remaining unsolved mysteries of Park School are, (1) what happened to the school records? and (2) is it possible to find or reconstruct a list of the faculty and students who attended Park? Perhaps the basement of Park Synagogue will yield the answers to these questions. Editor's note: Additional reference material and photos on Park School are available for viewing at the Superior Schoolhouse.